This letter was written by Samuel Hoag (1845-Bef1900) who enlisted on 11 August 1862 in Co. H, 43rd New York Volunteers. Samuel was the son of Sarah Hoag (1824-18xx) of Bethlehem, Albany County, New York. In the 1850 Census, Sarah and her son Samuel boarded with the Samuel and Elizabeth Van Allen family in Bethlehem. During the war, Samuel was captured in action on 4 May 1863 at Marye’s Heights during the Battle of Chancellorsville and paroled three weeks later. He was wounded on 10 May 1864 during the Battle of Spotsylvania and sent to Harewood Hospital in Washington D. C. Hospital to recover. We learn from this letter that he didn’t return to his regiment until mid-September 1864. He mustered out of the service on 1 June 1865. Hoag returned to the Van Allen residence in Bethlehem, New York, following the war and is enumerated there in 1870. By 1875 he had married a woman named Josephine (b. 1857), gotten a place of his own, and had a 2 year-old daughter named Minney. He later settled in Albany and found employment working for the railroad. The couple had at least two sons: Frank B. Hoag (b. 1881) and Roy B. Hoag (b. 1889). 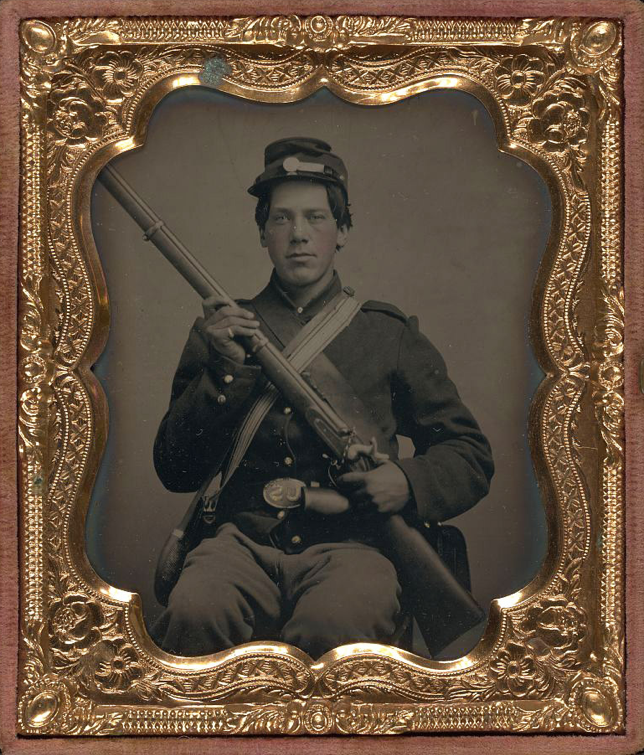 A number of Hoag’s Civil War letters are in the Hudson Valley Studies Archives at Bard College. Enclosed in this letter I send you one of the blanks I brought away with me. It is filled with the history of Leonard Arnold ² of the same company as myself who I met at Soldier’s Retreat [in] Washington [D.C.]. He is the first man I have seen belonging to my regiment since I left home which accounts for my not sending a blank sooner. I am now in Camp Distribution near Alexandria and when I arrive at my regiment, I hope to be able to send you all the blanks. I am enjoying good health at present and do not dread going to my regiment although there is a very good prospect of having some severe fighting. I have just written Ira [Van Allen] a letter in which I have given all the news. Hoping George B. McClellan will be elected to the presidency and that peace and unity be restored to our afflicted country. ¹ Camp Distribution was a hospital camp near Alexandria, Virginia, that became a station for soldiers awaiting their deployment orders. ² Leonard Arnold.—Age, 21 years. Enlisted, September 6, 1862, at Albany, to serve three years; mustered in as private, Co. H , September 14, 1862; captured in action, May 4, 1863, at Chancellorsville, Va.; paroled, May 21, 1864; wounded in action, May 6, 1864, at theWilderness, Va.; transferred toCo. B, Battalion, September 22, 1864; mustered out, June 16, 1865.